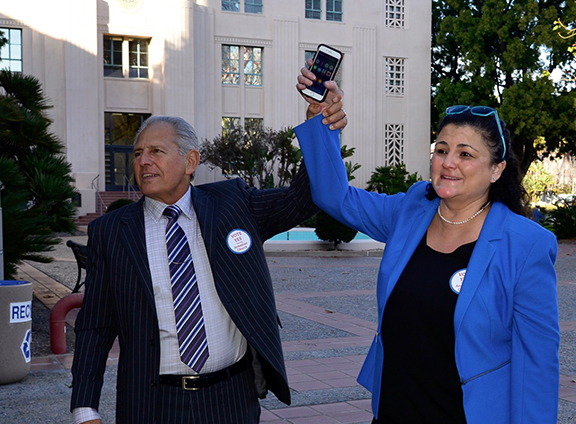 Victory celebration by church supporters following the Coastal Commission hearing. 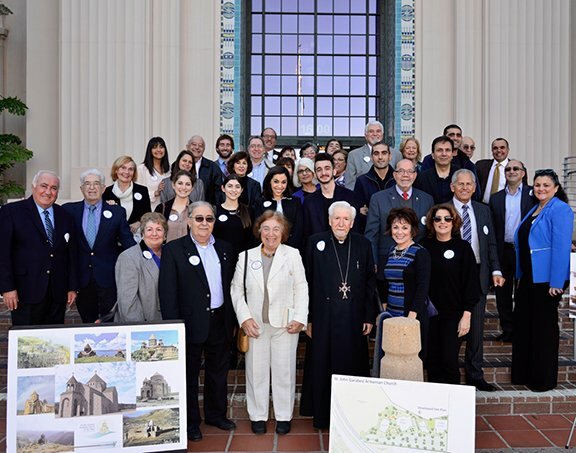 SAN DIEGO – In a historic vote of 11-0, the California State Coastal Commission approved St. John Garabed Armenian Church’s application to build a new church campus near Del Mar, California. 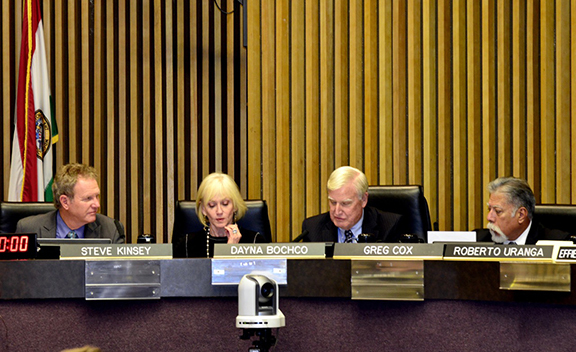 The vote was taken on Thursday, January 14, 2016 in the San Diego County Board of Supervisors Chambers. The new campus, which will be built in stages over a period of several years, will include a sanctuary, social hall, education center, library, gymnasium, youth center, Armenian heritage park, picnic and meditation space, and abundant parking. For more than one year, the church’s application has been under review by Coastal Commission staff. The church made numerous revisions and adjustments to be in compliance with coastal regulations. In fall 2015, Coastal staff sent a report to the commissioners stating that the church had met all necessary requirements with the exception of two staff-recommended conditions. Condition 1A proposed that the height of the church be lowered from 85 feet to 50 feet. Condition 1B proposed that the location of the church be moved to the back of the property (on the south side) so it would be less visible, essentially screening it from view. In his remarks to the Coastal commissioners, Harry Krikorian, chairman of the church’s Trust Fund Committee, stated, “Our proposed plans are for a place of worship, a place to socialize, a place for remembrance, and a place to preserve our culture, traditions and heritage. We are not a commercial enterprise but a non-profit Christian Church with a rich and proud history. Coastal Commissioners in deliberation before taking a final vote. Trust Committee Chairman Harry Krikorian enjoys a moment of recognition with the project’s professional consultant, Marcela Escobar-Eck. 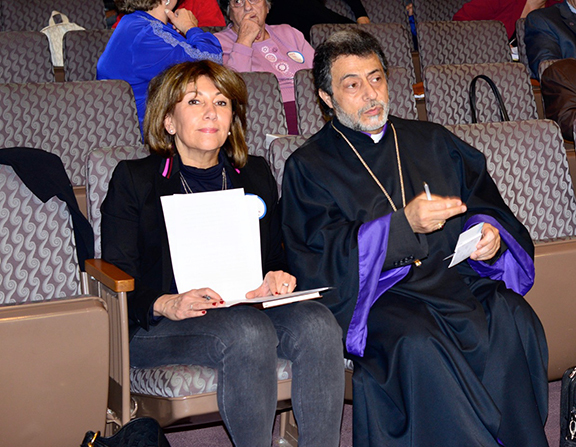 His Eminence Archbishop Hovnan Derderian, Primate of the Western Diocese, seated with Maria Mehranian preparing to deliver their remarks. Honorable Joe Kellejian, former long-time mayor of Solana Beach, concluded the church’s presentation by reminding the commissioners that the grandstand at the Del Mar racetrack is over 85 ft. tall and over a block long, and west of the I-5 freeway, well within the jurisdiction of the Coastal Commission. Commissioner Cox made a motion to approve the application, with an amending motion to delete Conditions 1A and 1B; the motion was seconded by Commissioner Mark Vargas. The Coastal Commission approved both the amendment and main motion with an unanimous vote. The history of this project dates back to 2008 when the Trust Fund Committee of St. John Garabed Armenian Church purchased close to 14 acres of premium property near Del Mar, California. On October 30, 2014, the project received unanimous approval by the City Planning Commission. The new property is located at 13860 El Camino Real in the City of San Diego between Del Mar Heights Rd. and Via de la Valle. For information about the Trust Fund Committee, new church campus, fundraising events, and giving opportunities, please visit www.stjohngarabedtrust.org or contact Harry Krikorian, harrykrikorian@msn.com or (760) 310-0064.